Imagine being surrounded by 360 degrees of blue water… then you see a large shadow approaching from the distance…getting bigger, and closer to you. Even though you are protected by a steel cage, you can hear your heart pounding like never before. The massive shark approaches just under the surface of the water, its large dorsal fin slices the water above, leaving a spray of water behind. You become mesmerized by its psychedelic markings and the sunlight reflecting over the shark’s metallic skin. Soon, the animal is so close you can look it in the eye. If you’ve ever dreamed of being in the water with one of the world’s greatest predators, our expedition is a unique opportunity to do just that. We limit our trip to only ten guests, which means you to stay with the sharks from morning to night. With no limiting factor but your sense of adventure and patience waiting for the shark visit your orbit. The clear waters of Guadalupe Island offer visibility from 60 up to 100 feet / 20 – 30 meters. Environmentally isolated and surrounded by deep water, this is one of the best locations to meet, photograph and film great white sharks. 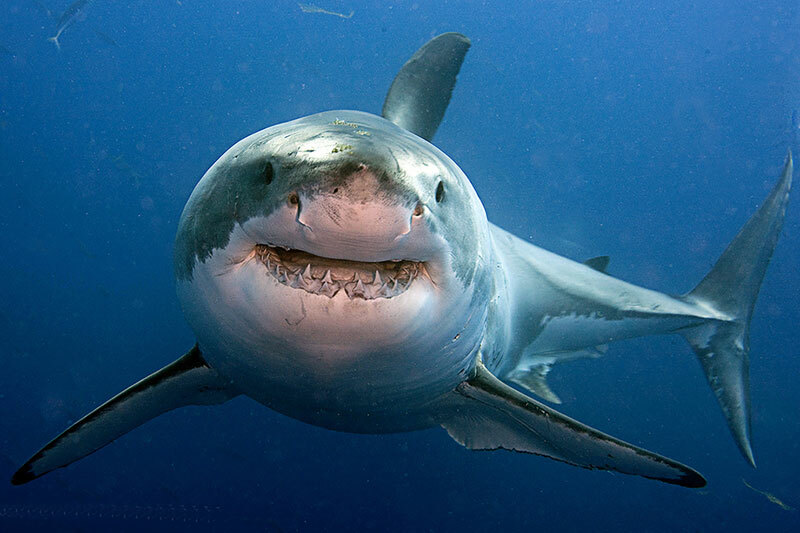 Researchers have identified and named more than 170 great whites based on the body markings exclusive to each animal. There are those who are content to see an amazing adventure on TV, and there are those who are ready to live it. Which one are you? We’ve timed our expedition for the peak season in November. This is when we could see 14 to 17 large females in the area. They come at this time to feed on the elephant seal. If you do this adventure only once in your lifetime, we think you should experience it at the most exciting and rewarding time. After all, your time away from home and business is most valuable.